The region abounds in pathways for strolling and trails for hiking. Some are tended by the Park Service, some by the Forest Service, some by myriad feet. The emphasis here is on scenes along those pathways rather than on the animals which might be encountered—usually, those pictures appear elsewhere on the site. Locals will recognize that many delights are missing from the short list, below—everything from Monica Meadows to the Great Northern Rail Trail. And what about Pulpit Rock, Kokanee Glacier Park and the Creston Valley Wildlife Management Area? There is room to grow. 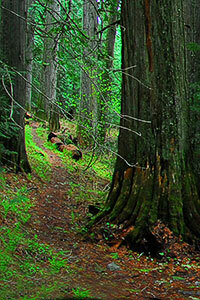 A clickable map provides guidance to local BC Parks sites. A list provides guidance to Kootenay Lake Forest District sites. In 2005, the responsibility for recreation sites and trails on Provincial Forest land was moved from the Forest Service to the Ministry of Tourism, Sport and the Arts. The Ministry’s interactive map presenting resources is superb, albeit not yet comprehensive.